class="post-template-default single single-post postid-339518 single-format-standard custom-background group-blog header-image full-width singular wpb-js-composer js-comp-ver-5.7 vc_responsive"
Click here to listen to the podcast of Saturday’s game. Kearney, Neb. 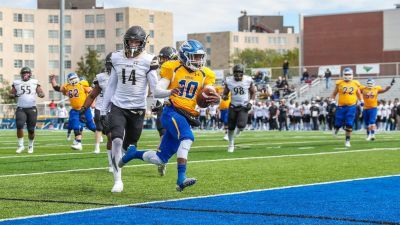 – The Nebraska-Kearney football team scored touchdowns on five of its first six drives and got eight pass breakups on defense to dominate Lindenwood, 41-14, Saturday afternoon at Ron & Carol Cope Stadium at Foster field. The Lopers (4-2) improve to 3-1 against the Lions (2-4) in Kearney and reach the four win mark for the first time since joining the MIAA in the fall of 2012. “With the early game (11 a.m. kick), we talked about getting off to a good start and these guys did that. Coach Josh Lynn has been very impressed with the work ethic of this year’s team. UNK’s option-based attack had the ball for 39 minutes to rack up 418 total yards (314 rushing and 104 passing). The Lopers led 10-0 after the first quarter, 24-7 at halftime and 38-7 midway through the third. “We controlled the line of scrimmage and our offensive line played outstanding. We also overcame some penalties that had us starting first and 15, first and 20. All in all, just great execution up front and Alex (McGinnis) got us in the right play,” said Lynn. A total of 28 points was scored over the final six minutes of the first half and in the opening minute of the second half. Head coach Josh Lynn dialed up a fake field goal on fourth and goal from the Lion five-yard with 6:19 left in the second quarter. The call worked to perfection as kick holder/backup quarterback Cody Summers (Denver) tossed a shovel pass to sophomore linebacker Travis Holcomb (Cairo) who was the right edge protector. “The credit goes to our special teams coordinator Levi Gallas. He came in on Wednesday and drew that up on the board. I told our guys we were going to run the play (fake PAT) after our first touchdown but we didn’t get the right look. So we just went ahead and ran it on the (short) field goal,” said Lynn. Now down 17-0, Lindenwood’s fast paced offense finally got on track as they drove 65 yards in just 2:47. However, a pooch kickoff didn’t work as well as sophomore back Dayton Sealey (St. Cecilia) brought it back 43 yards well into Lion territory. Aided by a pass interference call on third and 13, UNK recorded its third TD of the game when QB Alex McGinnis (Crete) plunged in from a yard out. That made it 24-7 with just 26 seconds left. The Lions could’ve scored a gain but senior corner Malik Webb (Roper, NC) batted down a 43-yard “Hail Mary” pass on the final play of the half. Lindenwood won the coin toss and deferred to the second half. On the second play from scrimmage in the third, redshirt freshman QB Cade Brister fumbled a snap and senior outside backer Cliffond Taylor (Miami) was there to pounce on it. On the very next play junior back Darrius Webb (Allentown, Pa.) scampered in from 13 yards out and to make it 31-7. The Loper offense ended the day with long TD drives of 68 yards (14 plays), 80 yard (six plays) 88 yards (18 plays) and 88 yards (12 plays). At one point, LWU had run 25 fewer offensive plays than UNK. Webb reached the 100-yard mark for the third time this year, tallying 127 on 17 carries. He scored twice, pushing his total to an MIAA-best nine. He gave all the credit to the guys upfront. Next, redshirt freshman Montrez Jackson (Trenton, Fla.) had 57 yards on just nine carries, Sealey had 56 on eight totes and McGinnis managed one score and 24 yards on 17 attempts. All toll UNK averaged a healthy 5.1 yards per carry. McGinnis was an efficient 11 of 14 in the air for 84 yards and one TD. The scoring pass covered 10 yards and went to junior back David Goodwin (Lauderhill, Fla.). Webb led Kearney in catches (four) with true freshman receiver D’angelo Shepherd (Colo. Springs) having a team-best 27 receiving yards. Lindenwood’s offense came in averaging 36 points and 413 yards per game. They were forced to punt three times, turned the ball over twice and were twice stopped on fourth down in the second half. One of those stops came at the Loper five-yard line. The Lions managed just 82 rushing yards on 23 attempts with the elusive Brister going 21 of 41 for 235 yards. Picked off by junior safety Kevin Wilson (Lakeland, Fla.), Brister did throw a 38-yard TD strike to senior back Cameron Sanders late in the first half. Defensively, Webb had three PBU’s with fellow corner Famous McKinnon (Miami) batting down two passes. Next, senior end Tye Spies (Mullen) had the team’s lone sack as well as six tackles with safeties Dallas Vaughn (St. Louis) and LaRoy James (Opa-locka, Fla.) both making seven stops. Finally, junior Sal Silvio (Kansas City) had a team-high nine tackles and one PBU. Lindenwood’s defense was led by safeties Darrius Williams (16 tackles; seven solo) and Grady Daniels (13 tackles; eight solo). “The four wins means a lot. We’re all bought in and moving in the same direction,” said Spies. “We’re all confident in what we’re doing. Coach Lynn has brought in the right guys and the players who’ve stuck around have the right mentality.” UNK heads to nationally-ranked Northwest Missouri State next Saturday. That’s a game you can hear on 93.1 “The River” and krvn.com.